PLEASE NOTE: I have moved to Belize, Central America, and won't be doing any more U.S. shows (though I will miss them!) I WILL SHIP TO THE U.S.
News Note: PLEASE CONTACT ME WITH ANY QUESTIONS. NOT EVERYTHING CURRENTLY HERE IS AVAILABLE. My name is Sheila Caim. I live in Belize, Central America, having moved here from West Virginia in 2013. 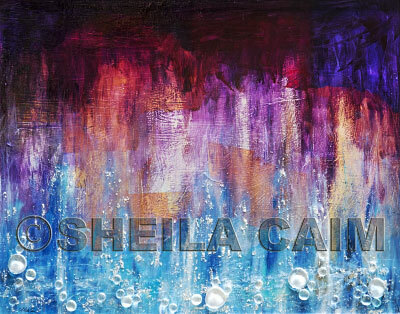 My work has evolved from fine-art photography and digital artistry to abstract acrylic painting and mixed media works. However, I still offer some fine-art photography and digital artistry prints and blank note-cards as well as my original paintings and collages. Of necessity, the selection of sizes for my prints are limited. Click here to see possible available print sizes. Of course my paintings and mixed media works are originals and so there is only one of each of them available for sale. I invite you to visit the works on my site and hope that you will find something you love. All Images on this web site are copyrighted by Sheila Caim and may not be used for any purpose without permission. Purchased work will be signed and will NOT have a copyright in the image area . At this time, payment by check only. Contact me for details. Size and price of original works shown next to its image.